Nesta Baxter is a European kickboxing champion. 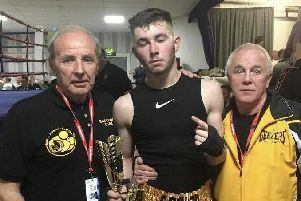 The Boston High School pupil claimed gold in the points category at the WAKO European Junior and Cadet Kickboxing Championships in San Sebastian, Spain. And Nesta (pictured) also claimed silver in the light continuous final. The 15-year-old, who trains at Boston’s Evolution Martial Arts, competed in the -55kg girls cadet (13-15 years) categories. In her points quarter-final, Nesta won 19-18 in extra time against her German counterpart. Nesta, who was selected as a Team GB flag bearer, claimed a unanimous victory against her Polish opponent in the continuous qualifier, before defeating a Hungarian in the quarter-finals in the same manner. Thursday’s semi-finals saw her matched against two Croatian opponents, progressing 13-7 in the points event and claiming the judges’ decision in continuous. Nesta’s first final was in points fighting. She trailed her Italian opponent in the first round but levelled things up with a points kick. During extra time Nesta earned a three-point margin. Saturday’s continuous final saw another Croatian opponent claim the judges’ decision 2-1, Nesta settling for silver. She is now preparing for the World Championships in Dublin next year.